This is a list of the Kings and Queens of the Kingdom of England from 924 until England and Scotland joined together in 1707. In 1066, William, Duke of Normandy invaded England. He defeated King Harold II and became King. 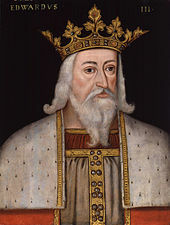 Edward III as he was portrayed in the late 14th century. The Tudors were from Wales. In 1536, Wales became part of England. England had controlled Wales since 1284. The Stuarts were also Kings of Scotland, with which kingdom England was in personal, but not Legal union until 1707. In 1707, England and Scotland joined together. For Kings and Queens after 1707, see British monarchs. This page was last changed on 15 August 2018, at 00:37.